Music Thing: Worried you're not a real geek? So buy an oscilloscope! Worried you're not a real geek? So buy an oscilloscope! Flickering waveforms? Glowing cathode ray tubes? Lots of knobs? What's not to like? 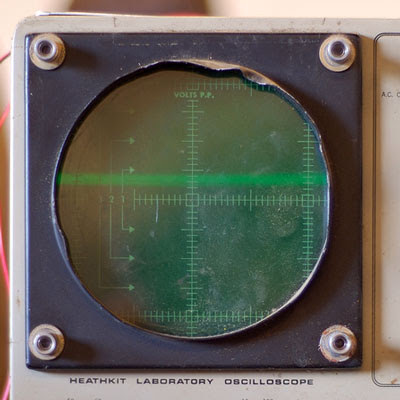 Ever since I first saw one on TV (and in the science labs at school), I've thought that oscilloscopes were cool. Since reading this really rather excessively geeky article from Mix Magazine, I realise I almost have an excuse to buy one - they're very useful for protecting your tweeters, or something. Also, if you've got an oscilloscope and a modular synth, then you might be able to make Scope Art. They only cost £60+ on Ebay, but I think this might be one step too far. I'm sure you could just find a nice software version. I fished mine out of a dumster along with a bunch of perfectly functioning power mac computers, a bunch of monitors and a sweet tube powered function generator....oh the things that a newly renovated high school will throw out! I've definitely seen oscillopscopes for cheaper than 60 (pounds or dollars) on ebay. The thing is, you may end up spending mroe on shipping than on the unit itself! I've always wanted one-not only cos I heard about Orbital using theirs to make the "orbital' symbol using a certain synth chord, but also cos recording your synths to a computer just to see the oscillator waveform seems like a totally backwards way of doing it!